I’ve been all about quinoa salad recipes lately. 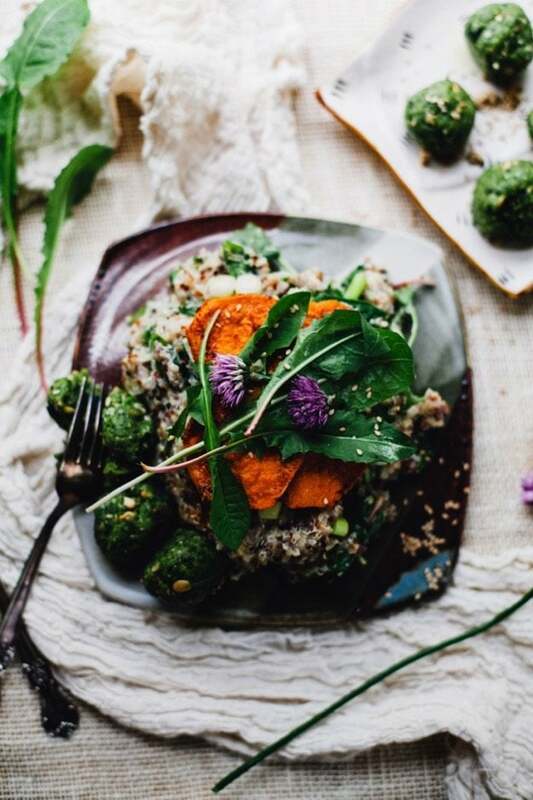 Quinoa is so easy to prepare, incredibly versatile, high in protein and fiber and can be served for just about any meal! 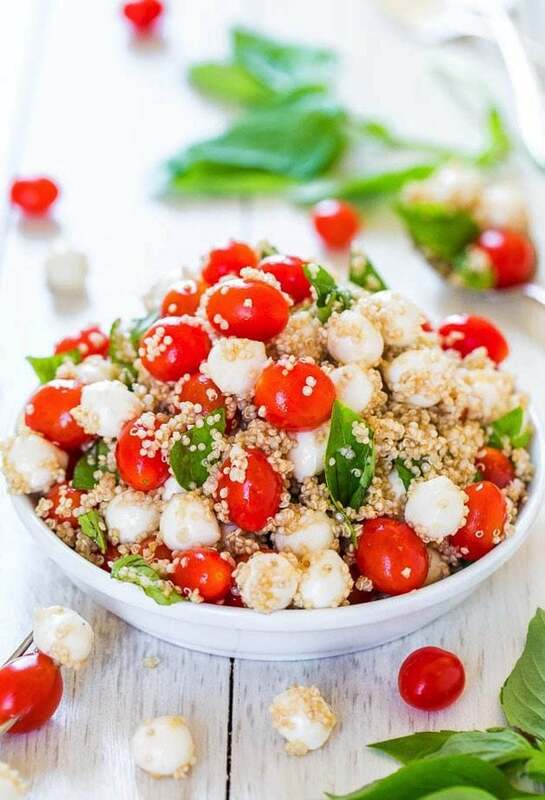 Quinoa salads are also great for meal prep because most of them can be made ahead of time! 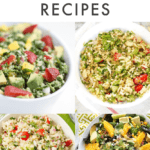 Naturally, I have a whole Pinterest board dedicated to quinoa recipes, many of which are quinoa salad recipes that I think you’ll enjoy so I created a roundup here with over 20 healthy quinoa salad recipes. Hopefully you’ll like them as much as I do and decide to make one (or two) this the summer. 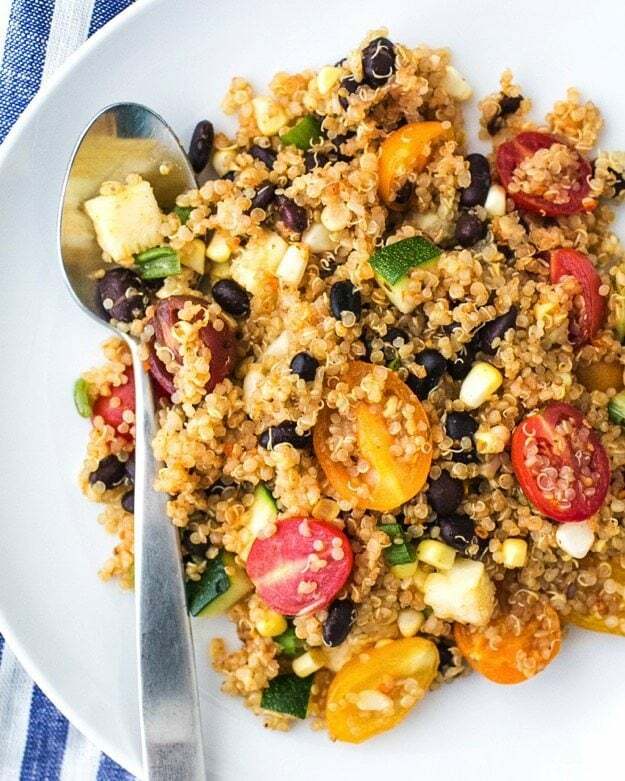 First thing first, let’s cover a few quinoa basics! Add quinoa into a pot and add double the amount of water. For 1 cup of quinoa you need 2 cups of water. 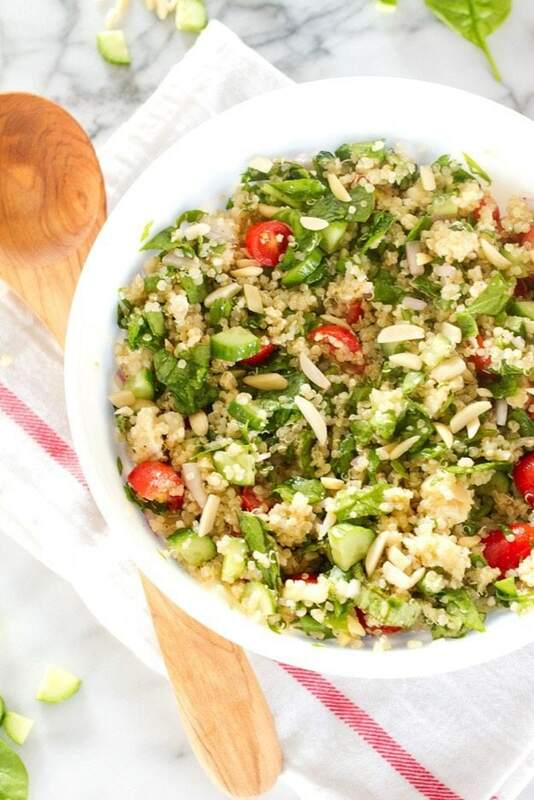 Let quinoa cool and use in salad recipes as directed. Why do you need to rinse quinoa? Rinsing your quinoa helps remove quinoa’s natural coating, called saponin, which can make it taste bitter. Note: There are a few quinoa brands some come pre-rinsed. If you’re looking to save time or don’t own a mesh strainer, look for one of these brands. 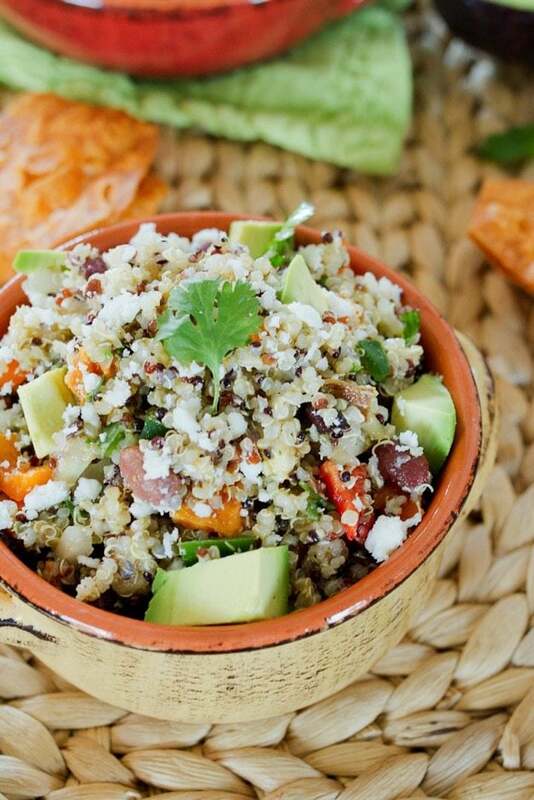 Now that we have the basics covered, let’s hop right in to these awesome quinoa salad recipes. I can’t wait to hear which one you’ll make first. 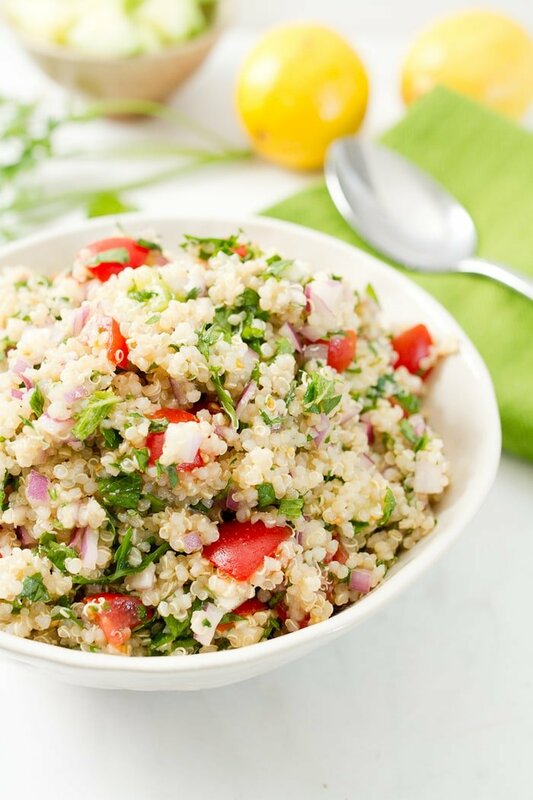 Quinoa is a great base for tabbouleh. 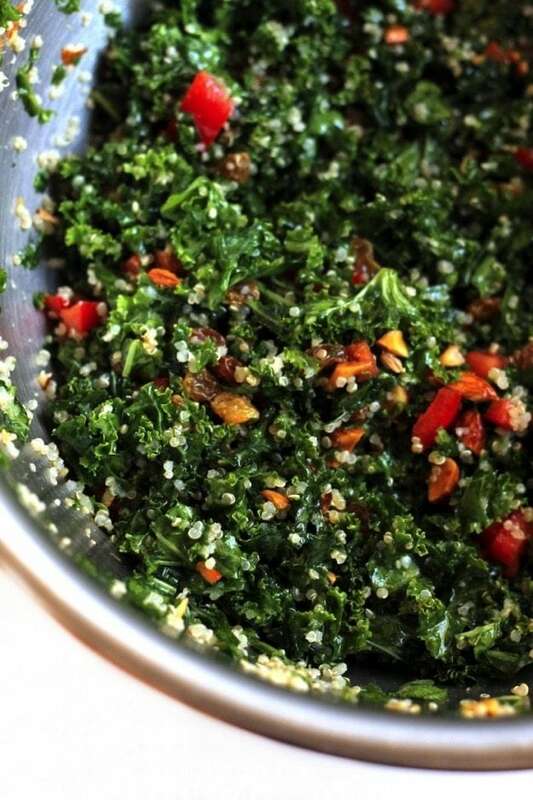 You just replace the bulgar with tabbouleh. The key ingredients in the recipe are parsley, mint, tomatoes, cucumbers, red onions and lemon. It’s easy to prepare and you can whip up a healthy salad in minutes. I don’t want to brag, but this might be the best dressing I have ever made. The ingredients are almonds, cilantro, paprika, cumin and little cayenne pepper. The salad itself is super simple. 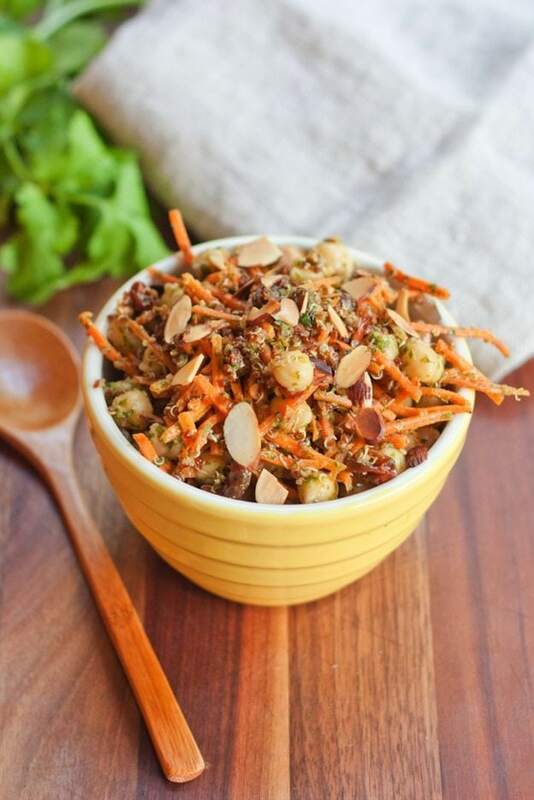 The recipe is a combination of chickpeas, shredded carrots, quinoa and raisins. The dish works as a light snack or for lunch or dinner as a meal. 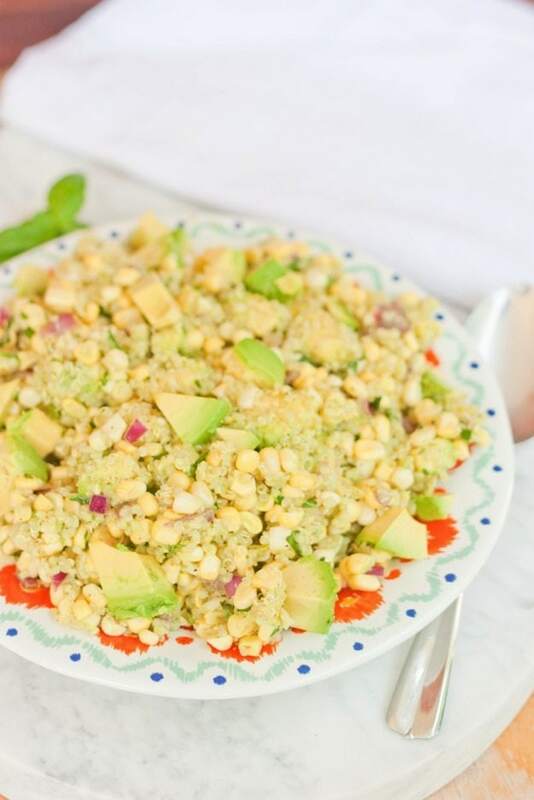 Corn and quinoa make a great combination. I added a little avocado for texture and flavor. The recipe also uses red onion, lime juice and herbs. I love this salad at picnic and potlucks. It’s the perfect wish on a sunny, summer afternoon. What’s not to like? 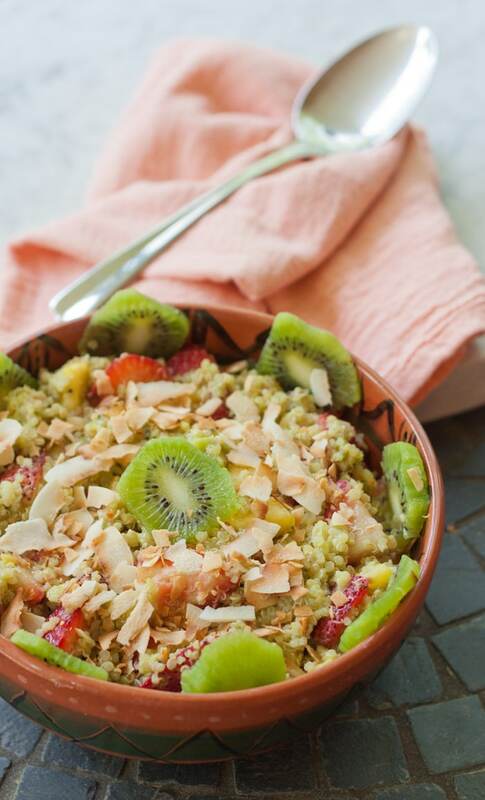 I combined the heartiness of quinoa with fresh fruit. The salad is moistened with a creamy avocado dressing. Dried coconut was added for flavor. I only used fresh fruit for the salad. You can use lot of different fruit, but I added pineapple, kiwi and strawberries. The recipe is full of vitamins and minerals. Here is a Mexican version of a quinoa salad. I combined bell pepper, black beans, avocado, cilantro and quinoa as the main ingredients. Cumin, chili pepper and cayenne add a little spice. If you enjoy Mexican food, you will love this dish. 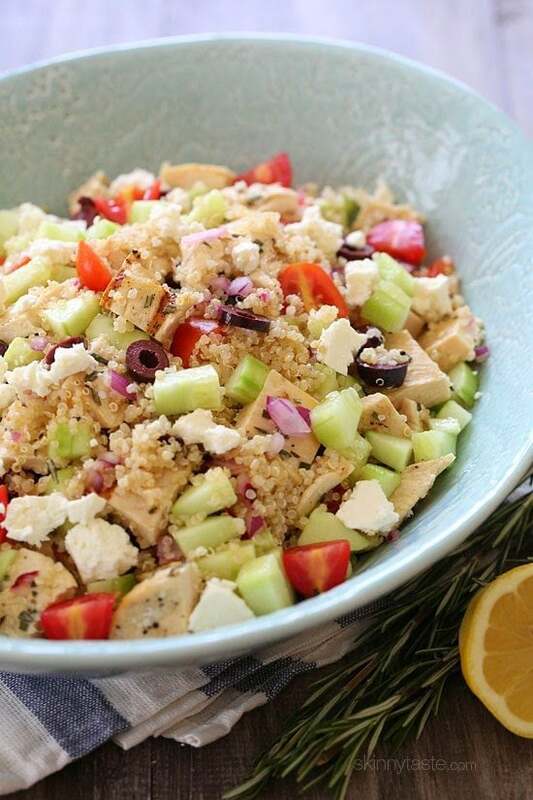 A great way to utilize summer vegetables is with this Greek version of a quinoa salad. For the recipe, I used baby spinach, tomatoes, cucumber, red onion, feta cheese and almonds. The dressing is a mixture of avocado oil, maple syrup and lemon. It’s a light, healthy way to enjoy the long summer days. Sonja and Alex at A Couple of Cooks have made this great take on the Southwestern quinoa salad. Fajita seasoning is combined with ingredients like quinoa, corn, onions, zucchini, tomatoes and black beans. The dressing is vinegar based. The salad tastes great and is super healthy. 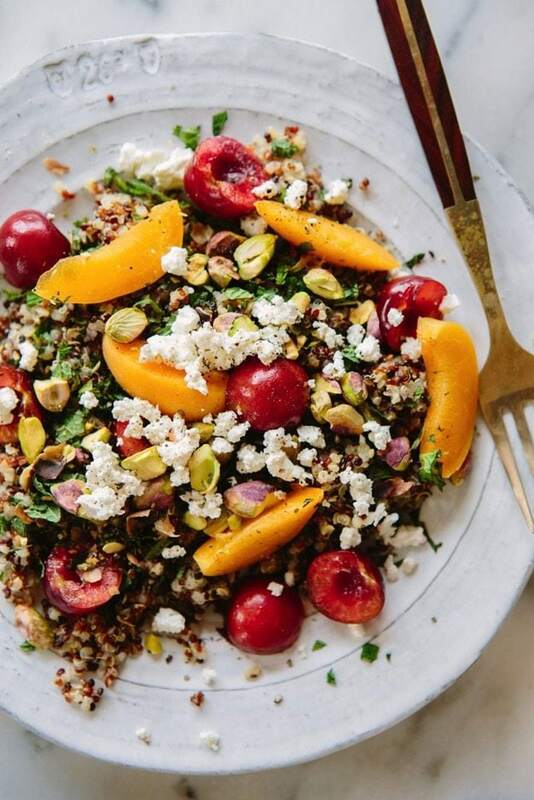 Cherries and apricots are the perfect way to add moisture and flavor to quinoa. The recipe calls for tri-colored quinoa, but I’d use any type of quinoa. Mint, shallots, orange juice and vinegar blend together to round out the flavors. It’s amazing. 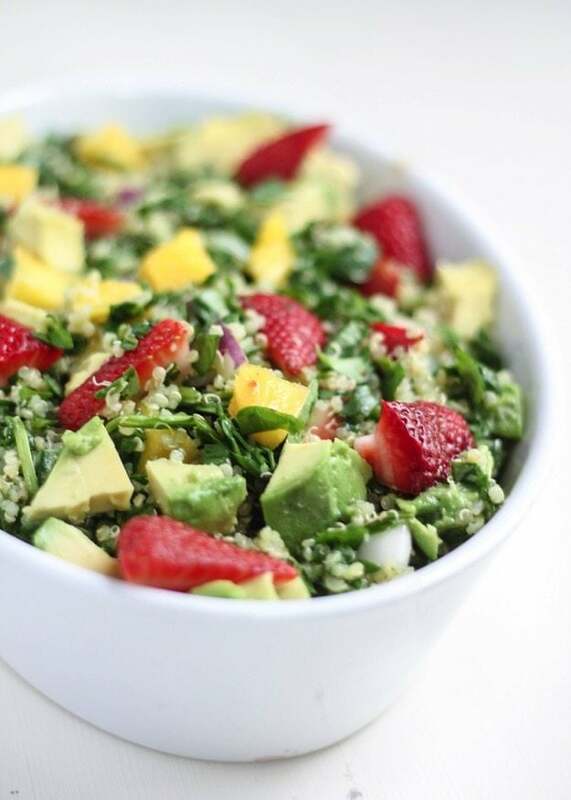 Baby spinach, mango, strawberries, avocado, red onion and cilantro are combined to make this quinoa salad. The dressing is apple cider vinegar, ginger, sesame oil, honey and lime. 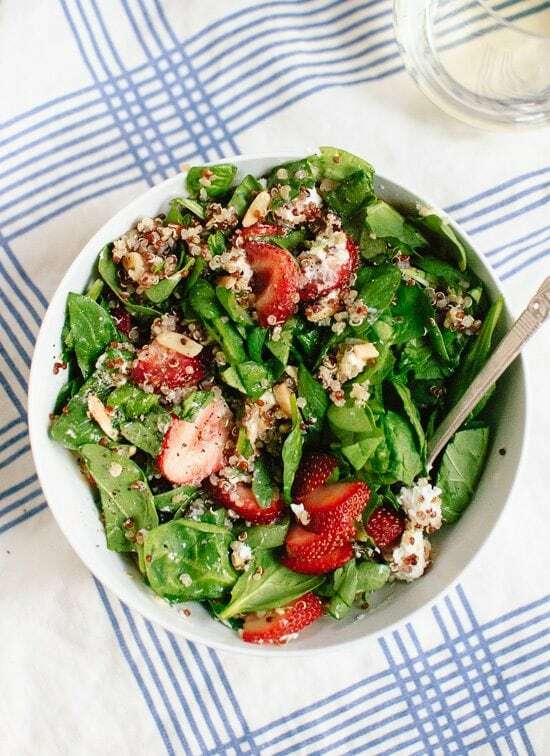 The spinach and fruit make this a super healthy quinoa salad option. You can use it as a side dish or main course. 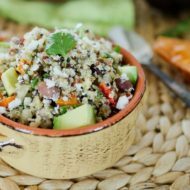 Fennel is a such a unique flavor for a quinoa salad, but it totally works in this recipe. Cherries add a little sweetness, and the overall palate is balanced with parsley, feta and sunflower seeds. Olive oil, lemon and honey are used for the dressings. 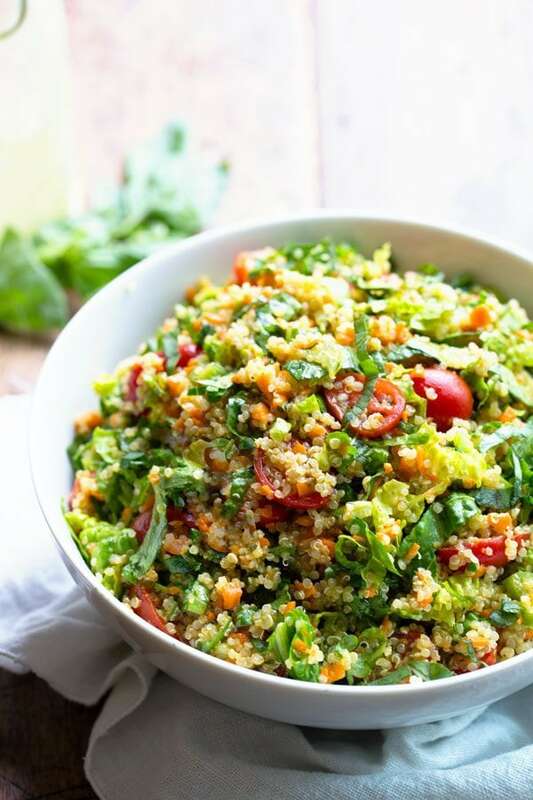 The quinoa in this recipe is soaked in a lemon vinaigrette. Romaine lettuce, carrots, cherries and parmesan cheese are combined to add texture and flavor. A handful of chopped herb is an important ingredient an adds spice to the dish. The salad does well in the refrigerator and is perfect as a leftover. What’s not to like here? The dressing is a mixture of avocado, lime, orange juice, sugar and Mexican spices like cumin and chili powder. 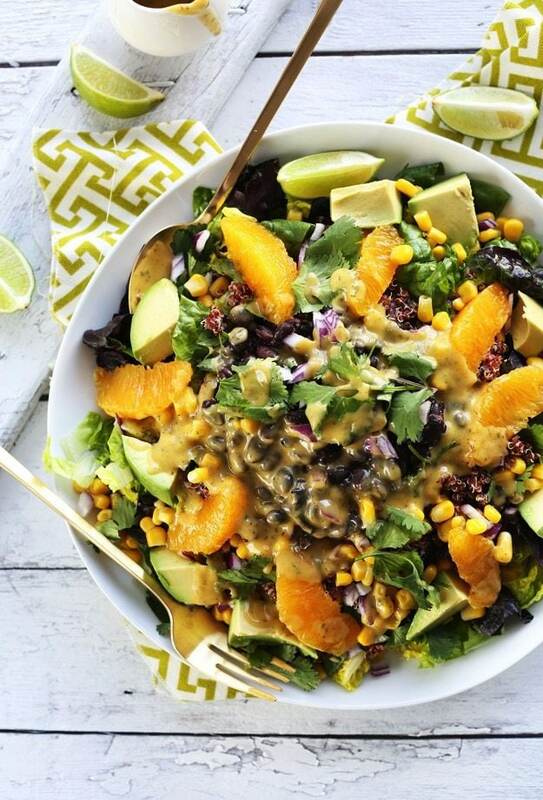 The salad contains mixed greens, black beans, red onions, an orange and cilantro. It’s a perfect south-of-the-border combination and makes a great side dish. This recipe is a combination of late summer vegetables and Thai peanut sauce. 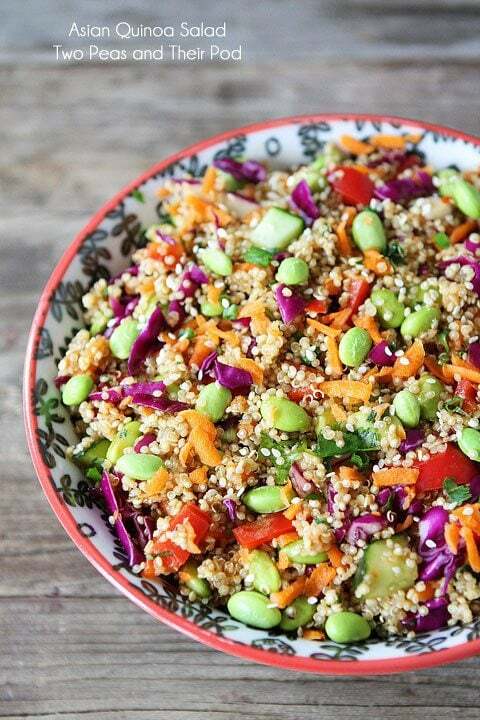 Red peppers, carrots, cucumbers, edamame, green onions, red cabbage and quinoa form the salad’s base. The sauce is lime, oil, ginger, red pepper flakes, peanuts and cilantro. It is a sweet and tart salad with a little bit of heat. Yummy! Kate and her dog pal Cookie have created an amazing quinoa salad with goat cheese and baby spinach. 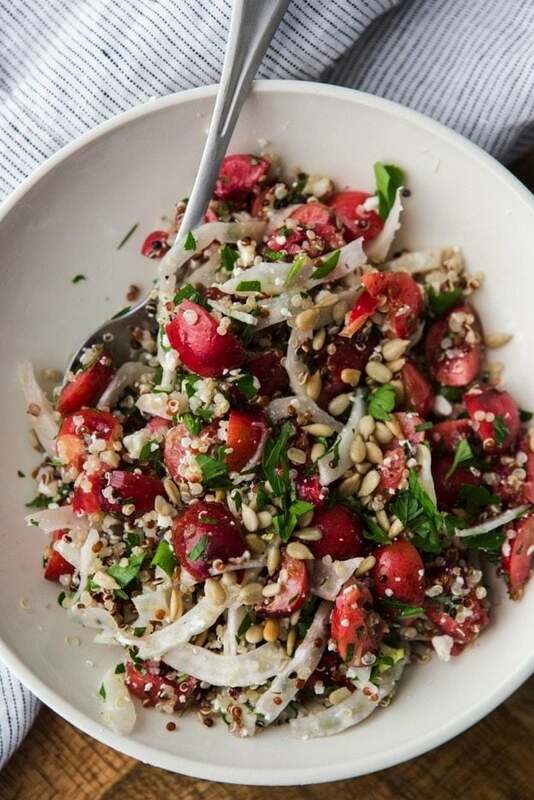 It only contains a small amount of quinoa, but it adds great texture to the salad. Strawberries and slivered almonds combine with a lemon and dijon mustard dressing. It a great version of a traditional summer spinach salad. Tomatoes and fresh basil are always a great combination. They are even better when you add a little quinoa, vinegar and oil. 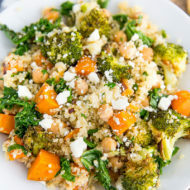 I’m a sucker for kale, and this quinoa salad recipe combines my two favorites — kale and quinoa — in a bowl. Raisins, almonds, bell peppers and avocados are also added. A lemon and oil dressing round out the salad nicely. It works as a side dish or main course. Early spring dandelion greens are mildly bitter and form the flavors for this out-of-the box quinoa recipe. Spinach, shallots, lemon juice and maple syrup are also added to a bowl. It’s a nice grain-free alternative to traditional rice-based risotto. Chicken is always a good option when making a quinoa salad. The recipe uses garlic, rosemary, lemon, red onion, lemon, kalamata olives, cucumbers, tomatoes and crumbled feta with the chicken. Salt and Pepper are added for flavor. It’s high in protein and tastes wonderful. The recipe combines red cabbage, edamame, carrots, red pepper and cucumbers in a bowl. It perfect for lunch or dinner. The dressing is soy sauce, oil, vinegar, cilantro, sesame seeds, ginger and red pepper flakes. 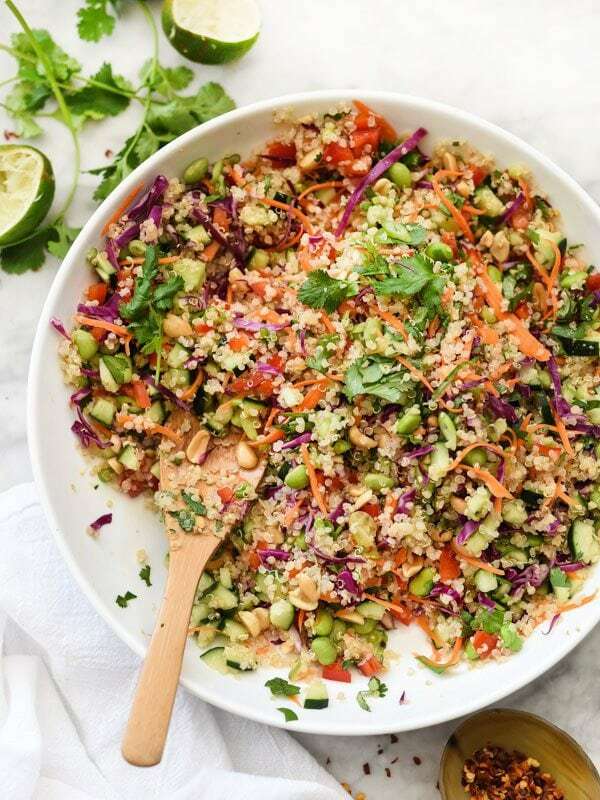 The salad is great Asian take on the quinoa salad. These all look fabulous! I’m a HUGE quinoa fan! 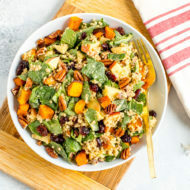 That quinoa mint and stonefruit salad looks crazy good! Love this round-up – all of these recipes look divine. I basically consider quinoa a food group, so these are right up my alley! I love a cold quinoa salad with roasted sweet potatoes and beets. It may not look pretty, but it’s very satisfying! This is timely! I just ordered a massive bag of quinoa because it’s hard to find here in the cornfields. Our produce market has a teeny bag for like $10 or something crazy like that. Delicious! I love adding quinoa to practically all of my salads. This is a great round up!